The genre of shoot 'em ups (shmups) or shooting games(STG) has been around since 1962. So, over the decades the genre has changed considerably. One thing that has never changed is that it challenges players as they seek a highscore. The are tough as nails and hardly welcoming to newcomers. So we arrive to our review of Danmaku Unlimited 3(DU3). Developed by the Sunny Tam of Doragon Entertainment, he continues to push what we think about shmups. So can a title released in 2017 set the bar? Find out in our review here. To effectively write about the experience of DU3, it made more sense to write from the stance of someone not familiar with these type games. The purpose of shmups again is to proceed through a number of stages (in this case 5) and reach the end. Along the way the player must survive and get a highscore -- Simple yes? Well now we get technical. You'll move your ship with your control of choice (I recommend gamepad!). You'll fire bullets and or use a stronger beam(which slows you down). You also possess bombs, which can clear enemy bullets caught in its explosion. 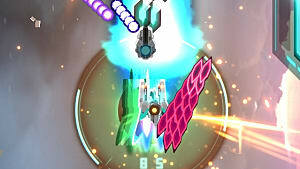 The game can be played in two modes spirit mode or graze mode. The modes are mostly similar but have some considerable notices. Spirit mode is essentially easy mode for players to begin with. Flying close to bullets will "graze" them. This adds energy to your trance meter. When an enemy is destroyed and their bullets are still on screen, they become harmless energy (ghost bullets) to collect. When you collect enough you can enter trance mode. This is done by default in spirit mode. Trance mode is a brief power up where all weapons are much more powerful. Your ship glows and your firepower is golden. Destroyed ships become gems when destroyed in trance -- these gems add to your high score. Graze mode again, is the same except for a few features. Bombs automatically will be used if the ship is about to take damage. If there are no bombs for protection, you'll lose a ship and this can lead to a game over scenario. When the meter is full, the ship goes into graze-high. Only during graze-high will destroyed enemies leave behind ghost bullets. This will eventually allow you to enter trance mode. Trance mode can be activated manually. Now that you've got the basics that when the game becomes much more. DU3 is a constant trial to beat your best score. From the ground up the title has been built with this in mind. Stages occur in phases(the rhyming wasn't intentional). You'll face off against smaller minor enemies, than larger more threaten ships appear, and eventually you'll reach that stage's boss. 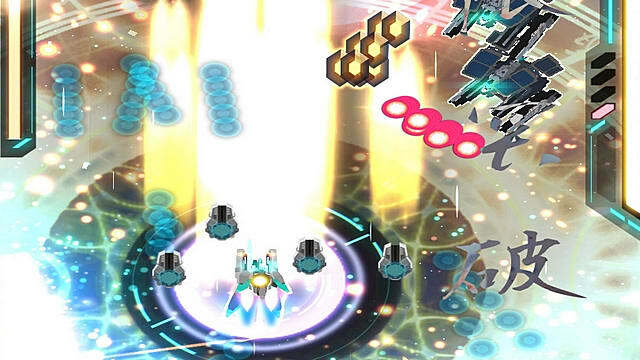 The stage boss is often a ship with a lot of firepower. As you fight or rather survive, there are a few things to keep in mind. The boss' AI has different attack patterns so you'll need to be able to adapt to win. Oh, did I mention that bosses also possess the ability to enter trance mode? The screen will darken and pause. At this time they become very aggressive so be extra careful. Boss fights also provide you chances for bonus points. If you defeat the boss within a certain time limit or do so flawlessly you will be rewarded. This is all of course dependent on what difficulty you're playing. The purpose of a high score is for bragging rights and additional content. Your score will be presented via the worldwide leaderboard. The game will also unlock weapons and specials for example if you score a trillion points in a playthrough. This is doable but will take you some time. To add more to the DU3 experience, is the time asked of you the player. As a shmup the time dedication is relatively minor. You can set aside a few hours or less to play through the game. Within that time you could've conquered a new difficulty and unlocked a new achievement. Time is such an important part of the gaming experience it can be relatively difficult for us to find. So it's very noteworthy that this game was designed with this in mind. Now here's an important note about playing shmups that you learn playing DU3. With bullet hell titles, you of course have to survive from a a very likely game over. You don't focus on th entire screen necessarily. You have to focus on the area surrounding your ship. When you hone in and focus, that's when the highscore reaches a new stratosphere. Speaking from a visual standpoint DU3 is beautiful. The time and attention to the sprite work is very clear. I haven't played a shooter with this kind of detail. From every bullet, beam, explosion, and etc. it stands out. The 5 stages are all different types of airspaces and each one notable because the cohesive art design. Bullet hell never looked this good. The next impressive portion to DU3 is the music by Blankfield. The music within the game is high soaring rock. Stages BGMs begin either melodic or ambient but then the guitar kicks in and pushes you further. The most fitting music is when you are in battle with the stage boss -- Calling the music impressive is still underselling it, its fantastic. Overall, DU3 is an excellent arcade shooter from start to finish. Now if I had to make note of a one blemish, its the difficulty. Despite how well-design it is, causal players will still find it too difficult. Its a nonissue really. The game also has a story and symbolism you may miss this if you don't pay attention. The stage names refer to topics of music and matters of air warfare to name a few. You may need to do a little research to see how it all comes together. This too is pretty unconventional when it comes to games, where you leave the messages in names and the follow of stage alone. 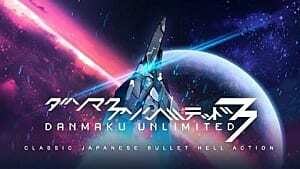 If you enjoy arcade shooters and shmups in general look no further. 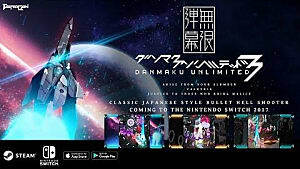 Danmaku Unlimited 3 is the best representation of the genre. 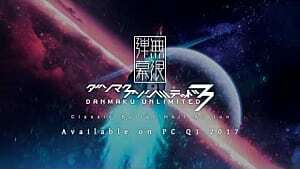 Danmaku Unlimited 3 is now available for Steam. Note: A review copy was provided by the developer.